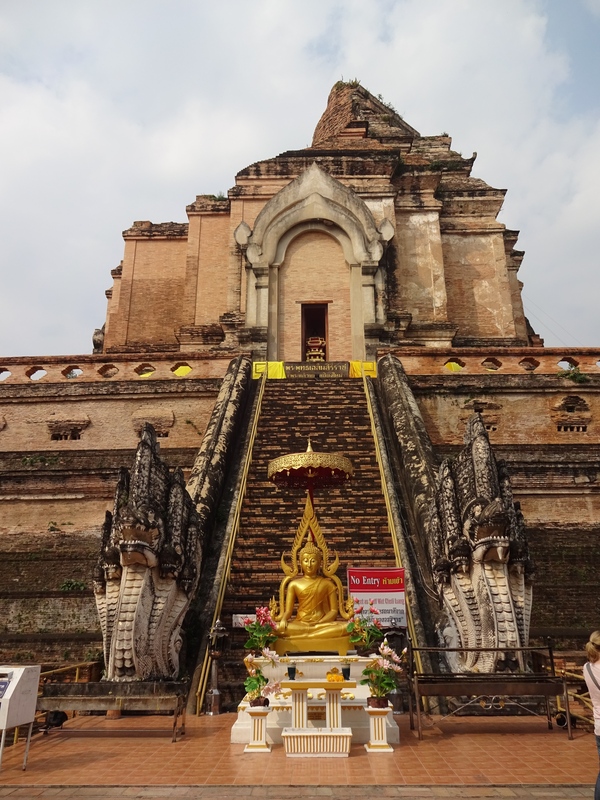 I don’t quite recall how my attention was drawn to Wat Chedi Luang. Maybe it was mentioned in some online resources I reviewed recently. Maybe it was Lonely Planet. But regardless, I took off this morning to see it. 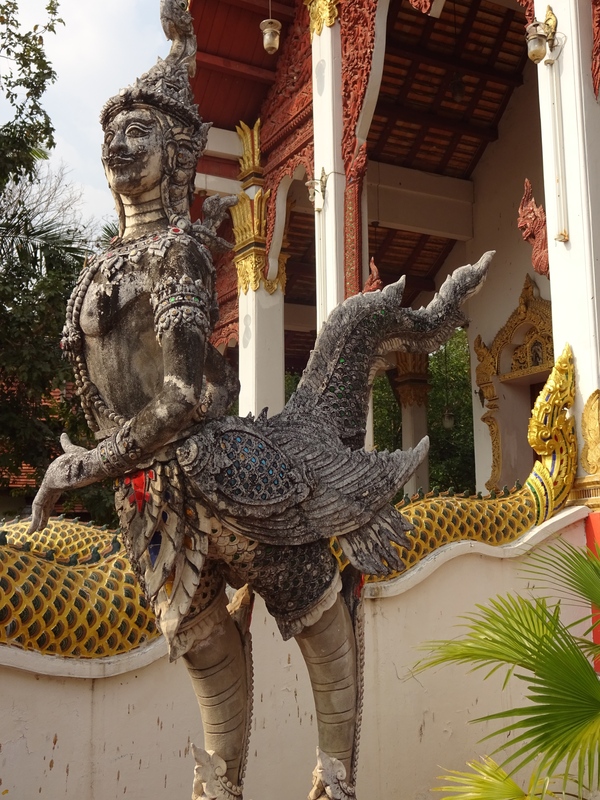 It’s within the walled city of Chiang Mai, only a block from neighborhoods I have frequented several times already. It was also easy to find because there was ample evidence of tourist interest. 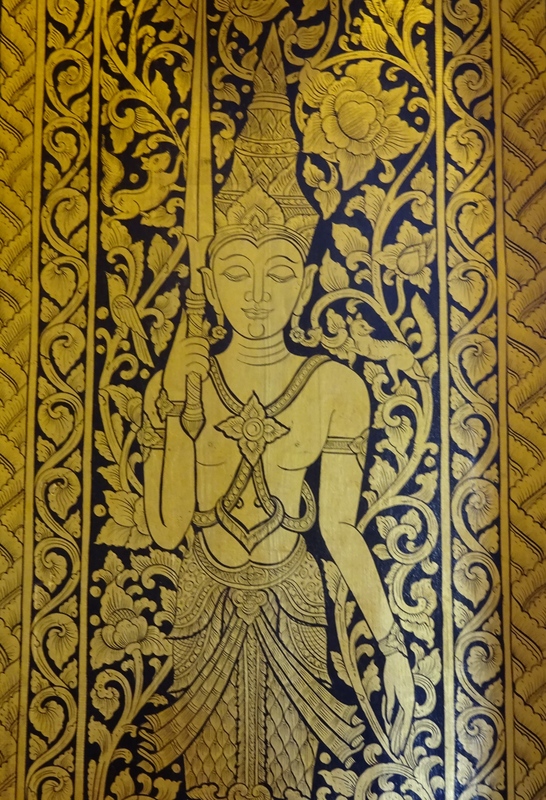 Some of the unique qualities might be due to the period of its construction, the craftsmen or maybe some difference in the sect or tribe that constructed it. 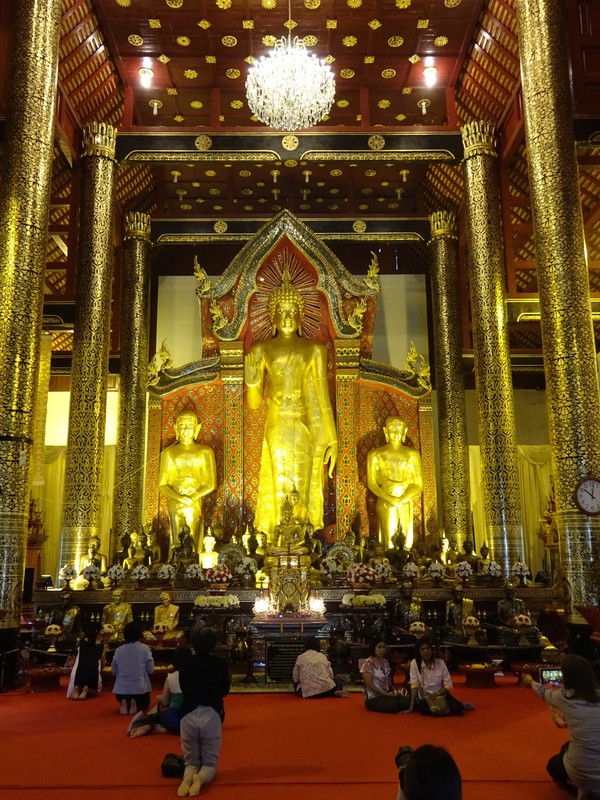 This is certainly true of Wat Chedi Luang. In fact, I was completely unprepared for what I was about to see. 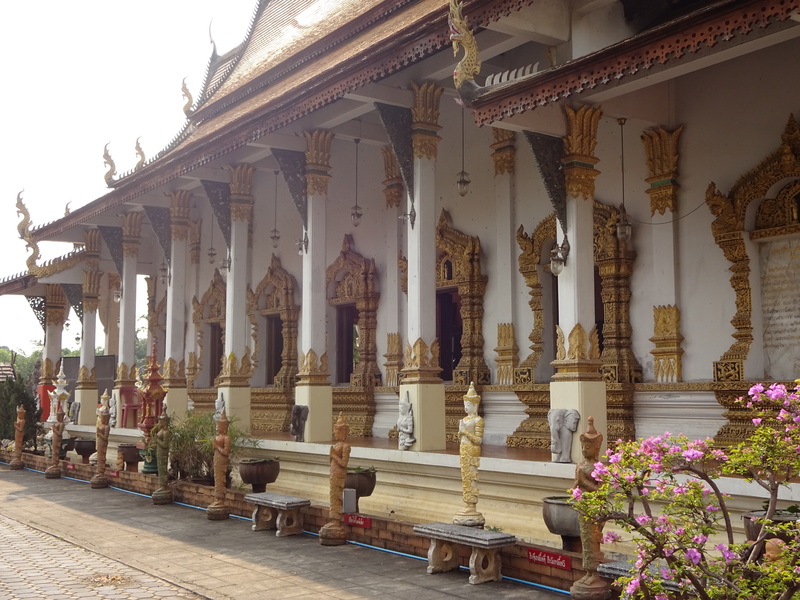 The complex itself is about 200m square, quite sizable for an urban temple. There was the chedi itself (pictured above), constructed at least 600 years ago by a succession of Thai kings, the more recent main temple, outlying buildings, a Buddhist school, smaller sanctuaries erected in reverence for significant teachers, and what is now museum housing sacred texts. I am only showing a small part here. The chedi is a Thai stupa made of brick and stone. This one is about 150 high. 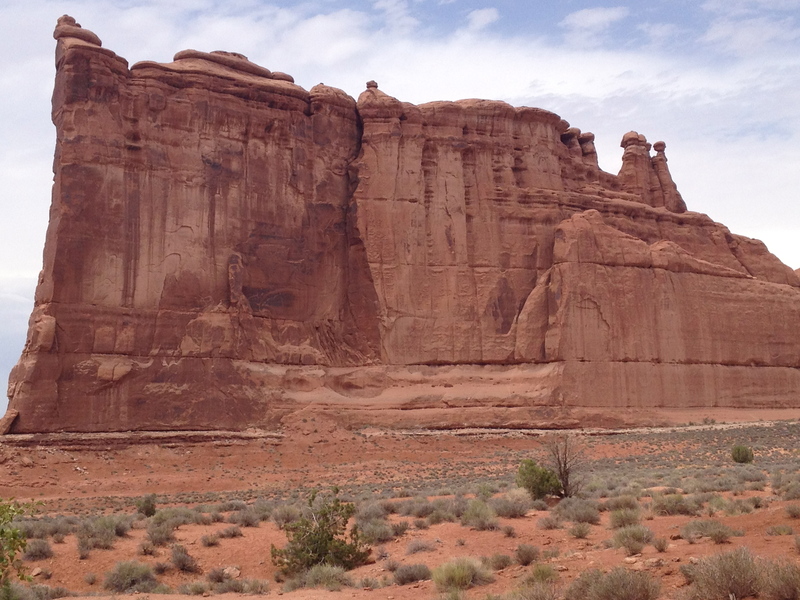 It’s massive presence reminded me of “The Courthouse” in Arches National Park that I visited in 2013. Although The Courthouse, at least a quarter mile long and more than 300 ft high, is much more massive, the chedi at Wat Luang has the same feel of conveying The Law. You can see that one side of the chedi crown has fallen away, apparently from an earthquake long ago. 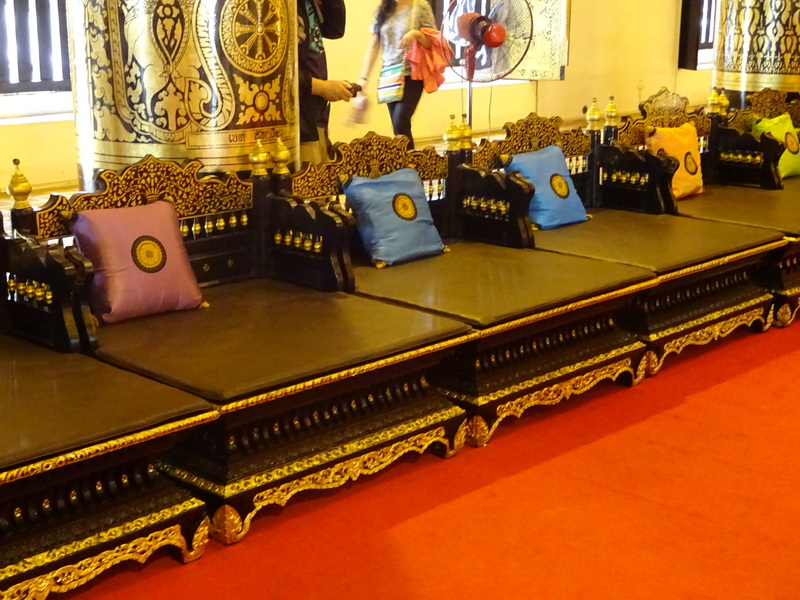 There are buddhas implanted in small atria on each side and around the base. 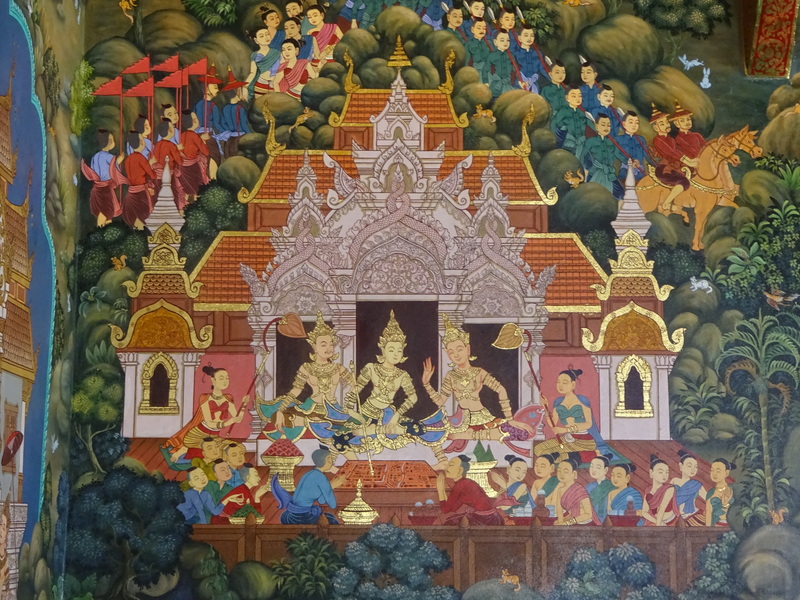 The main temple is the jewel of this Wat. I don’t think I even took a picture of the outside. There’s nothing really distinctive about its size or design. But nothing prepared me for what I would encounter inside. 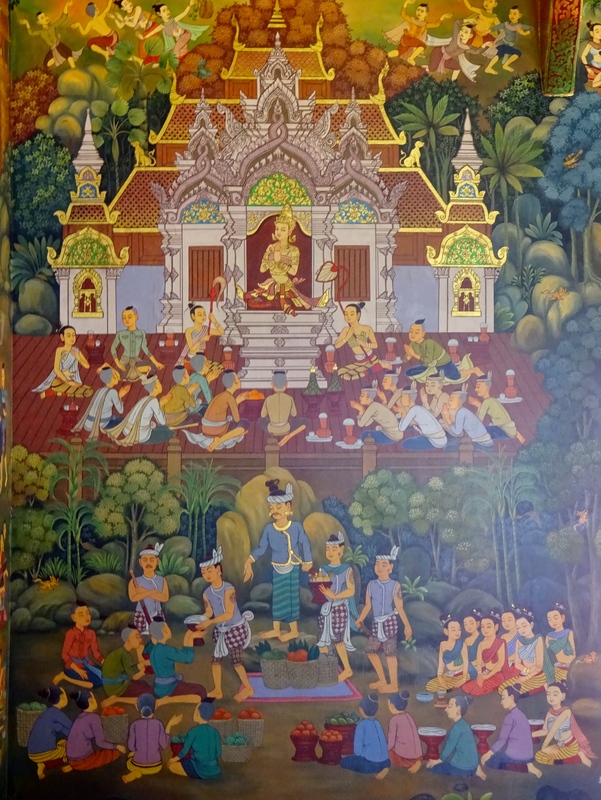 I walked in among a regular stream of tourists of many origins as well as local Thais visiting for worship. I managed to get to the middle of the great room as they filtered around me. 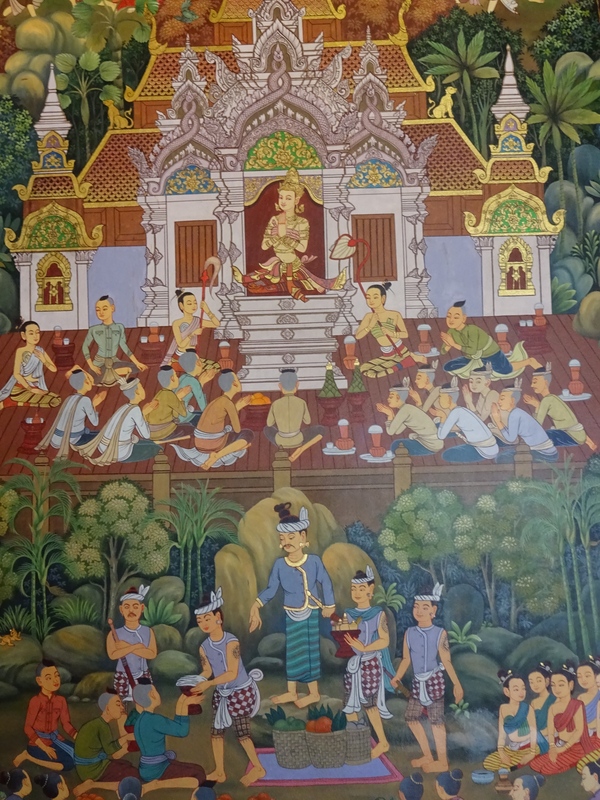 There are massive painted pillars supporting the roof, large windows with open wooden shutters, lacquered in the familiar style, and a row of carved wooden pedestal seats for monks. 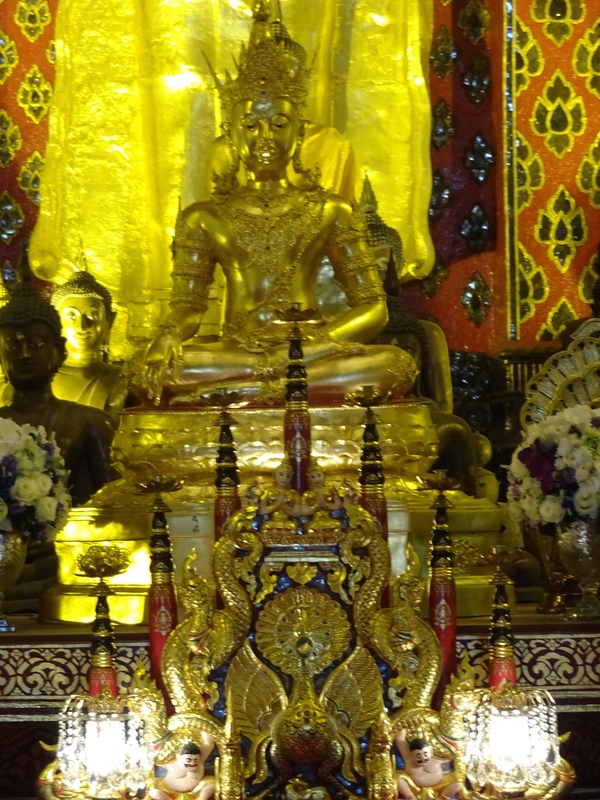 Looking up at the central buddha at least 40 feet tall, standing in blazing gold, with several rows of seated buddhas in front, there was no way to resist or manage in any way what erupted in me, but this altar was so overpowering I began to weep. I can’t even say why. Maybe it was the massive devotion of its creation or the power of the transmission of the teachings, but I couldn’t stop. I dropped to my knees for several minutes, just allowing whatever it was to flow through. The only time anything like that had ever happened to me was when I first stood at the base of the Karmapa’s stupa in Crestone, Colorado, the header photo of this blog. May all beings be happy and have the causes of happiness. May they be free from suffering and its causes. May they never lose the happiness free from sorrow. and remain in great equanimity. When I calmed down, I wandered out to a small sanctuary nearby. 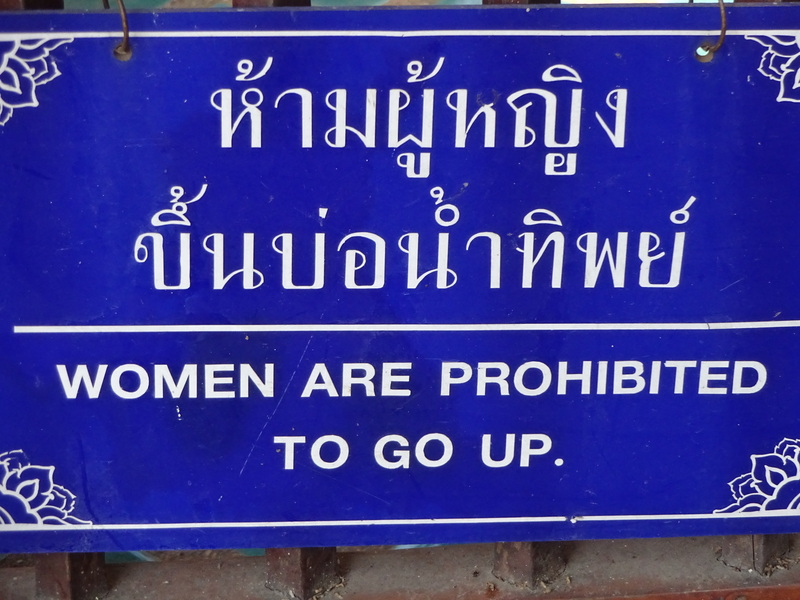 There was a familiar sign on the steps barring women from entering. I’ve seen a number of these signs. They are quite common. But I had no idea why they exist until today. Inside were beautiful paintings on all the walls, floor to ceiling, maybe 20 feet high. 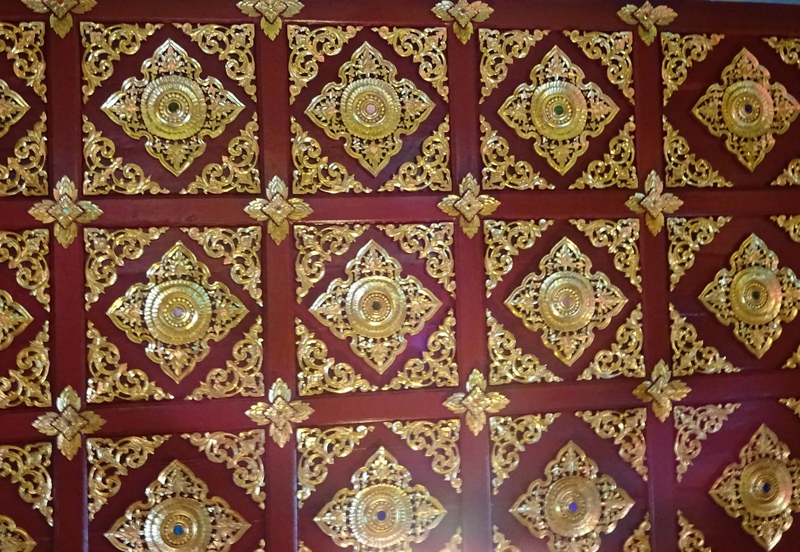 The ceiling was decorated as well. I thought how terrible that half of humanity is prohibited from seeing this. More than terrible, even. 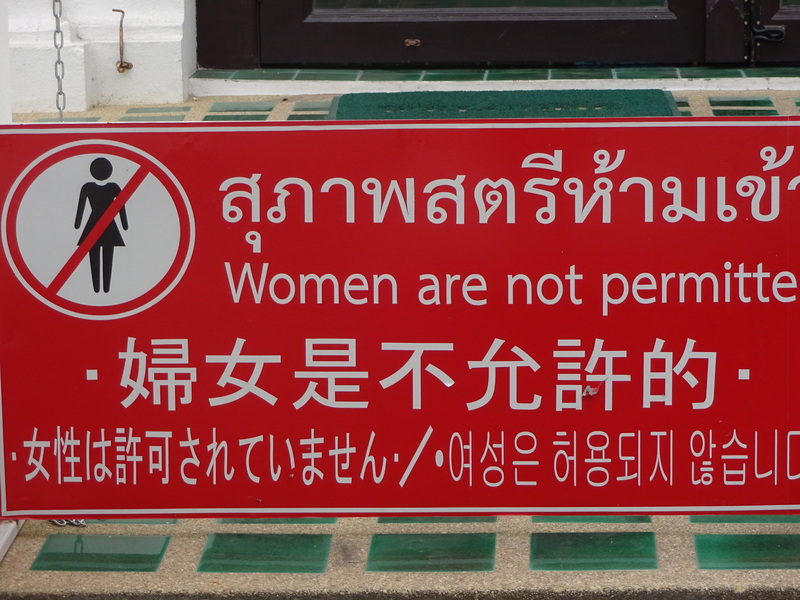 When outside again, I went back into the temple to ask someone why women are not allowed into that small sanctuary. The only english-speaking attendant, an elderly woman, could not quite give me an answer that I could understand. Something about blood. But she acknowledged that she herself had never been inside that small sanctuary. Ever. Then I spotted a guide with a western couple and wormed in to ask him why. He said it was because women bleed. Centuries ago, before there was anything like a sanitary napkin, it was possible that a woman might bleed on the floor during worship. So women were barred from certain sanctuaries to avoid having the floor soiled. I asked why that was still the case. Or why even post-menopausal women couldn’t go in. He could not say. I suppose the answer is another question: why are there certain religious traditions all over the world that still hold sway, like barring women from the priesthood, for example? Hmmm. Maybe there’s a relationship here that I’ve never considered. It seems almost daily there is something about being here that evokes awe. Even very simple things like the mix of flavors in my dinner, the unassuming nature of the people, the routine integration of devotion into life, the simple beauty of the natural surroundings. This is certainly not a perfect culture or a paradise. But if there’s a footnote to this day, it can only be that you can never know what will crack you open. You can never anticipate or plan it. All you can do is be there when it happens. The beauty of those moments is the freshness they provide, the sense that the mirror has been wiped clean and that you can really see the truth of what, and who, is right in front of you, just as it is. 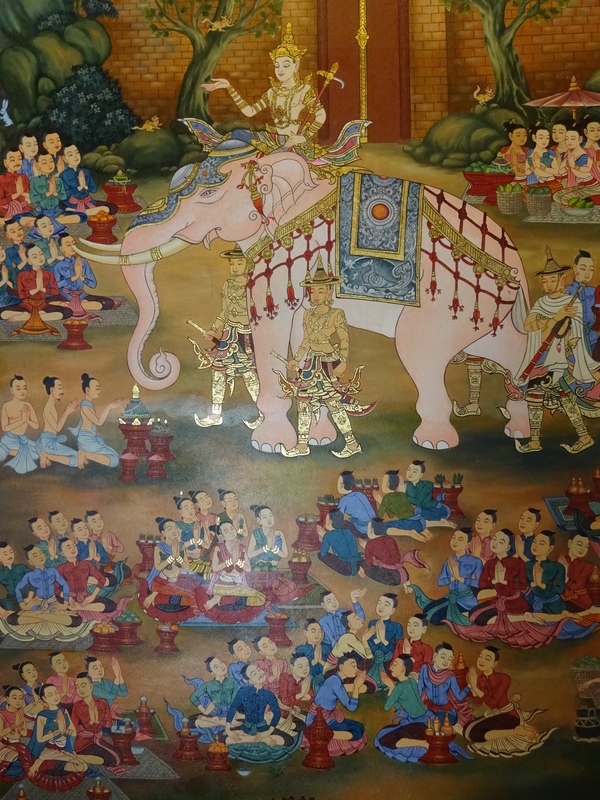 This entry was posted in Buddhism, Thailand, Travel and tagged Arches National Park, buddhist temples, buddhist worship, chiang mai, thailand, touring Thailand, Wat Chedi Luang, Wiang Kum Kan by garyhorvitz. Bookmark the permalink. Thank you for the four boundless states. This is a fine prayer. I wish it for my son and my daughter and my wife. And myself. And you. Your comments and sentiments are always welcome. 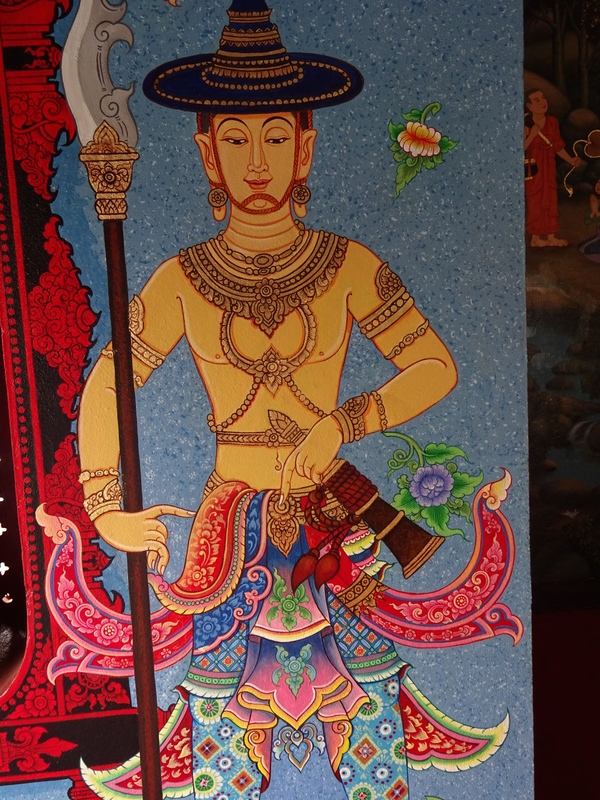 This mere prayer is a doorway into some of the very foundation of buddhism.